The Crime Investigation Department (CID) of Assam Police detained one youth on Saturday on suspicion of his involvement in the theft of the astadhatu idol of Goddess Ugratara inside the Ugratara Temple in Guwahati. According to media reports, the apprehended youth has been identified as one Jamaluddin. Media reports also stated that Jamaluddin, who was picked up from the Guwahati Railway Station colony, has been interrogated by the Crime Investigation Department sleuths at Latashil Police Station. It may be mentioned that the astadhatu idol of Goddess Ugratara inside the Ugratara Temple in Guwahati was stolen in the wee hours on Friday. The thief, along with the idol, also looted gold and silver jewellery and coins besides the donation box from historic Ugratara Devalaya, located in the western side of Jor Pukhuri near the Latashil Police Station in the city. 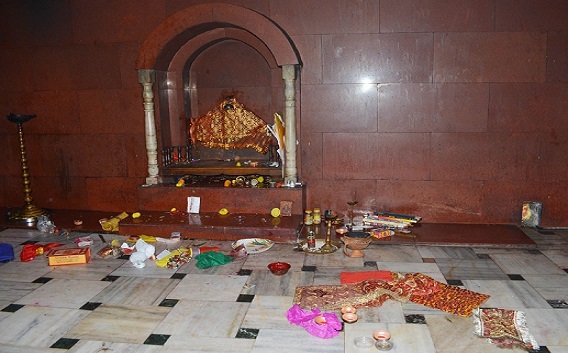 The astadhatu idol of Goddess Ugratara has been worshipped in the temple – which is revered as one of the 51 Shakti Peeths of the Hindus in the country – since 1044 AD. Police said, a case (No 271/18) under sections 457 and 380 of the Indian Penal Code has been registered at the Latashil PS. Kalita had also informed that they had observed only one person in the CCTV footage going inside the temple and again outside. “We are investigating into the case,” he had said.